In the course of their researches for Mental Imagery in the Child (1971), the authors came to appreciate that action may be more conducive to the formation and conservation of images than is mere perception. 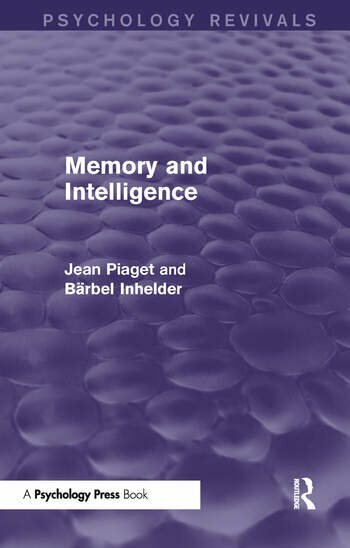 This raised the problem of memory and its relation to intelligence, which they examine in this title, originally published in English in 1973. Through the analysis primarily of the child’s capacity for remembering additive and multiplicative logical structures, and his remembrance of causal and spatial structures, the authors investigate whether memories pursue their own course, regardless of the intelligence or whether, in specified conditions, mnemonic improvements may be due to progress in intelligence. They examine the relationship between the memory’s figurative aspects (from perceptive recognition to the memory-image) and its operational aspects (the schemata of the intelligence), and stress the fundamental significance of the mnemonic level known as the ‘reconstructive memory’. This was a pioneering work at the time, presenting illuminating conclusions drawn from extensive research, together with a number of constructive ideas which opened up a fresh approach to an important area of educational psychology. Preface. Collaborators in this Work. Introduction: The Problem of the Memory and its Place Among the Cognitive Functions Part 1: Remembering Additive Logical Structures 1. Remembering a Simple Serial Configuration 2. Remembering an M-Shaped Serial Configuration 3. Remembering Equivalent Numerical Sets Arranged in Different Rows 4. The Remembrance of Conflicting Numerical and Spatial Correspondences 5. The Remembrance of Transitive Relations 6. Remembering Associative Operations Part 2: Remembering Multiplicative Logical Structures 7. The Remembrance of Double Serial Correspondences 8. The Remembrance of Double Classifications 9. The Remembrance of Class Intersections 10. The Remembrance of an Arrangement Part 3: The Remembrance of Causal Structures 11. Remembering a Causal Process Represented by Levers 12. The Remembrance of a Transmitted Motion 13. Remembrance of an Incomprehensible Causal Process 14. The Remembrance and Growing Appreciation of a Causal Problem Part 4: The Remembrance of Spatial Structures 15. The Remembrance of a Geometrical Transformation (Rotation) 16. The Remembrance of Horizontal Levels 17. Remembrance of Three Triangles of Different Shape and Equal Area 18. Remembrance of the Positions and Orientations of a Moving Body 19. Remembrance of Contingent Figural Combinations with or without Classification 20. The Reconstruction of a Geometrical Configuration with Partly Contingent Elements. General Conclusion. Index.